Manager of J's Maintenance, dedicated community volunteer, family man, hiker, and businessman. Chris is committed to clean energy and passionate about building quality relationships with his clients and conducting business ethically. 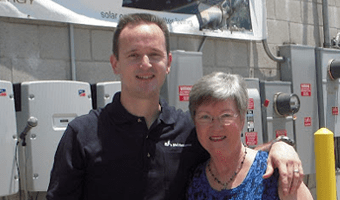 Chris is pictured here with his late mother, Linda Waldheim, at the 2012 dedication of the J's Maintenance solar power installation.